(Verso) lower right, in pencil: "W.Eggleston"
(Verso) lower left, typed text: "This photograph is not released for/ publication or commercial use of/ any kind. All rights reserved." (Verso) lower right, in pencil: "I/IV Printed 1980"
"Sometimes I like the idea of making a picture that does not look like a human picture. Humans make pictures which tend to be about five feet above the ground looking out horizontally. I like very fast flying insects moving all over and I wonder what their view is from moment to moment. I have made a few pictures which show that physical viewpoint. . . . The tricycle is similar. It is an insect's view or it could be a child's view." 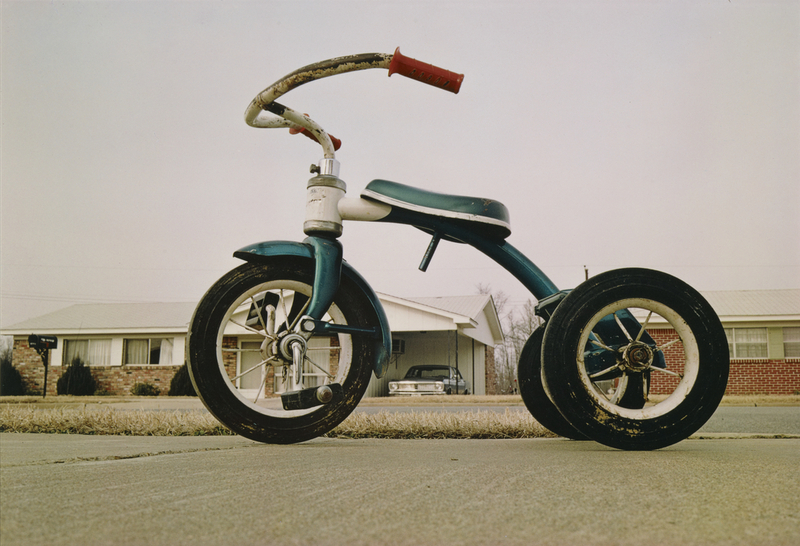 Thus William Eggleston explained the radical perspective he employed in this photograph of a child's tricycle seeming to dwarf the homes and automobile in the background. This photograph graced the cover of the catalogue for Eggleston's groundbreaking exhibition of color photographs at the Museum of Modern Art in 1976.